1431 January 1 Rodrigo Borgia is born at Xativa in Spain; October 26 Ercole I is born in Ferrara. Wednesday, 30 May 1431, the 19-year-old Joan of Arc is burnt in Rouen. 1452 September 21 Girolamo Savonarola is born in Ferrara. 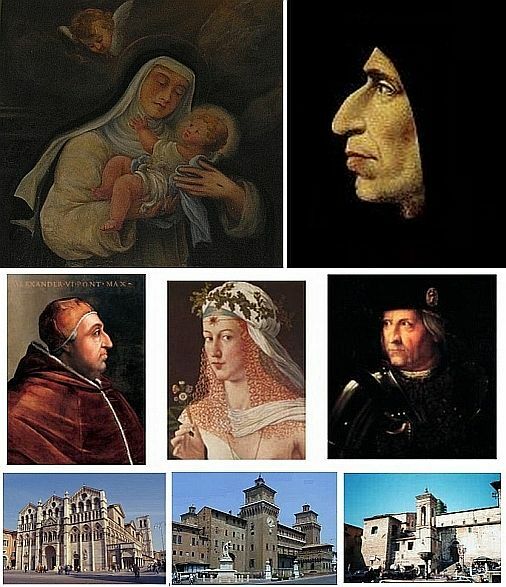 1474 March 23 - Lucrezia's close friend Giulia Farnese, is born in Canino, west of Viterbo.. The Cathedral and the Castle of Ferrara - The Cathedral of Narni. 1476 December 13. Lucia Brocadelli, the oldest of the 11 children of Bartolomeo Brocadelli and Gentilina Cassio, is born in Narnia. 1480 April 14. Lucrezia Borgia, the third of four children of Rodrigo Borgia and Vanozza dei Catanei, is born in Subiaco. 1483 November 10. Martin Luther is born at Eisleben in Saxony. 1487. The Dominican Inquisitor Heinrich Kramer ( Henricus Institoris: 1430-1505 ) publishes in Strasburg the notorious witch-hunter's handbook "Malleus Maleficarum" (The Hammer of Witches); considered "one of the most vicious and damaging books in all of world literature". 1489. Lucia Brocadelli's spiritual director, Padre Martino da Tivoli, the prior of the convent of St. Dominic in Narni, allows 12-year-old Lucy to make the wow of perpetual consecration. 1490. Lucia is thirteen. Her father Bartolomeo, the treasurer of Narni, dies being only 40 years old. Her uncles and relatives begin pressing her to marry. 1491. The 14-year-old Lucia marries the 22-year-old lawyer Count Pietro di Alessio from Milan (the adopted son of his aunt who is living in Narni) and becomes the Countess Lucia di Alessio (La Signora Contessa Lucia). 1492 August 11 Lucrezia's father Rodrigo becomes Pope Alexander VI. On October 12 "Columbus discovers America". 1493 June 12 The 13-year-old Lucrezia marries Giovanni Sforza, Lord of Pesaro. 1494 March 30. Soon after the beginning of Lent (February 12) Pietro di Alessio puts Countess Lucia in solitary confinement. On the Easter Day, March 30th, she escapes to her mother's house. Pietro remains calm and patiently keeps waiting for her return. But she does something he had never expected. 1494 May 8 (Ascension). The seventeen-year-old Lucia receives from her spiritual director Padre Martino da Tivoli, the habit of Dominican Tertiaries and becomes Sister Lucia of the Third Order of Saint Dominic. Her furious husband tries to kill Padre Martino and burns down the Dominican priory. Despite his constant harassment Sister Lucia stays in Narni with her mother until the beginning of 1495. 1495. With the support of her uncles, Suor Lucia goes to Rome and enters the monastery of the Dominican Tertiaries near Pantheon (in which St. Catherine of Siena died in 1380). Her sanctity impresses everyone so much that by the end of the year Master General of the Dominican Order Joachim Turriano, decides to send her as the prioress with five other sisters to found a new monastery of Dominican tertiaries in Viterbo. (There is also another version of this event). 1496 February 25. The 19-year-old Lucy arrives in Viterbo by the end of January and at the convent of St. Thomas, in the morning of the second Friday of Lent, 1496 February 25, she receives the Sacred Wounds (the Stigmata), which begin to bleed more and more profusely. During the Passion Week, Lucy seems so close to death that her mother and Padre Martino are summoned from Narni. But she survives - and immediately becomes a celebrity. Special commisions are formed, a local medical examination of her stigmata takes place and then their ecclesiastical investigation by the inquisitor of Bologna, Dominican Giovanni Cagnazzo de Tabia. All attest their authenticity. (Another version describes the first two investigations slightly differently). At some later time in 1496 Count Pietro di Alessio meets Lucia in Viterbo; for the first time since 1494, and also for the very last time. Then he returns to Narnia, sells all his property and joins the Franciscans (He died in September 1544 - just a month and a half before Lucy - as a fine preacher with the reputation of sanctity; often using the examples from their married life in his sermons). 1497 April 23 begins the third investigation of Lucy's Stigmata wounds, conducted by another Inquisitor of Bologna, Domenico di Gargnano. Much more thorough than the first two - the detailed notarial document can be found in Kramer's Clipeum. 1497 May 13 the pope Alexander VI excommunicates Girolamo Savonarola. Meanwhile the fame of Sister Lucy continues to spread and reaches Ferrara (about 370 km or 230 miles to the north). Duke Ercole I d'Este (Ercole il Magnifico: 1471-1505), asks Domenico da Gargagno to write to Lucia and to invite her in his name to Ferrara as his counselor, promissing to build her a monastery. Lucia accepts his offer immediately. The Duke begins negotiations with the papal court, with the Dominican Order and the municipal council of Viterbo. 1497 August 9. Duke Ercole himself writes to Sister Lucy telling her that he is very pleased with her decision and that he is sending her two monks and two mules to pick her up. 1497 December 20. The pope annuls Lucrezia's four-year marriage to Giovanni Sforza. 1498 January 18. The pope requests Lucia to be sent to him in Rome; the municipal council of Viterbo refuses to let her leave the city. (Another version, describing her visit and her conversation with the Pope seems improbable). 1498. Duke Ercole (who has been in contact with Savonarola since 1495) also keeps writing repeatedly to the Florentine Signoria asking for his release. His letters have no effect. 1498 May 23 Fra Girolamo Savonarola (1452-1498) and two of his companions are burned at the Piazza della Signoria in Florence. Some of his followers flee to his home city of Ferrara which now begins to become a center of the Savonarolan spirituality. At the hour of Savonarola's execution "a nun in Viterbo has a vision of three Dominicans being summoned by singing angels to Paradise" ("It is not unlikely" that this nun was LB). 1498 July 21. 18-year-old Lucrezia marries the 18-year-old Duke Alfonso of Aragon (Bisceglie). 1498. The Pope and the General of the Dominicans cotinue to keep writing to the city of Viterbo again and again, asking them to let Lucia go and threatening severe penalties if they don't.. The magistrates of the city continue to refuse. In 1901 Luigi Gandini found and published 61 letters of the Duke, Sister Lucy, her uncle and Captain de Fiorano, beginning 1497 August 9 and ending 1500 April 13. This whole colourful affair can be found there in much detail ("Sulla venuta in Ferrara della beata Suor Lucia da Narni..."). 1499 April 15. Finally 22-year-old Lucia secretly leaves Viterbo. Escorted by the Duke's soldiers she stops at her mother's house in Narni and on 1499 May 7th she is solemnly received in Ferrara, as the spiritual guide and personal adviser (madre spirituale e consigliera) of the Duke Ercole I d'Este - who meets her with his Court at the city gates. (The entire process cost him about 3000 ducats...). Immediately 13 young candidates apply at her new religious community. They are joined by Lucia's mother Gentilina who arrived to Ferrara together with her and with some other noble Narnian ladies. 1499 June 2, less than a month after Lucia's arrival, the Duke Ercole himself lays the first stone for the construction of the convent and of the church of St. Catherine of Siena (then on the street of St. Catherine, now Via Arianuova). 1499 November 1 Lucrezia's and Alfonso's son Rodrigo is born. 1500 January 1. Girolamo Savonarola's niece Veronica, at the age of thirteen, receives her habit of a Dominican Tertiary and the religious name of Suor Girolama at Lucy's community of Santa Caterina da Siena. (Twice the prioress, she died there in 1553). 1500 March 2. The fourth official inquisitorial examination of Lucy's stigmata wounds is conducted by the papal nuncio and inquisitor Heinrich Kramer (the author of the notorious 1487 witchcraft treatise) who is on his way from Rome to Moravia (now Czech Republic). March 4 Duke Ercole writes his famous letter, outligning his theory of the efficacy of holy women (see below). 1500 Summer. Lucrezia's deeply beloved 20-year-old husband Alfonso of Aragon is murdered and two months later the pope formally proposes her in marriage to the Prince Alfonso d'Este of Ferrara (his father Ercole is very upset and yields only 1501 July 8. The verbal marriage contract then takes place on 1 September). 1501 April 20. The Inquisitor Kramer publishes in Olomouc (in Moravia) a manual for preachers how to confute heretics ("Sancte Romane ecclesie fidei defensionis clipeum...") which also contains a lengthy letter of Duke Ercole I of 1500 March 4, affirming the authenticity of Lucia Brocadelli's mystical gifts and the notarial document of her 1497 April 23 examination in Viterbo. (The first printed biographical notice about Lucy). 1501 May 29. The promulgation of the official Breve of Erection by the Pope Alexander VI which nominates Lucia as the first prioress granting her the final authority and a number of exceptional priviledges to her whole community (freedom of movement etc)..
1501 August 5, on the feast of Saint Dominic, Suor Lucia and her 22 companions solemnly move into their long-awaited new convent. When completed (in 1503), it had special quarters for 'La Madre (Abbadessa) Suor Lucia', 46 cells for novices and 95 cells for the sisters; it also had an exceptional number of sacred paintings and other works of art. 1501 September 16. 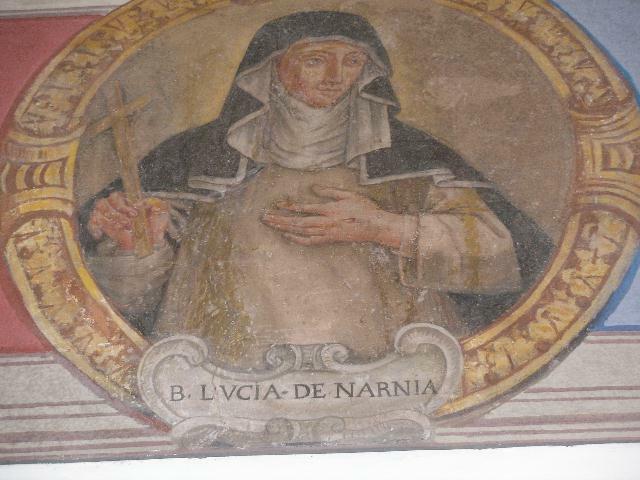 The Inquisitor Kramer publishes in Moravia a booklet about the mystical experiences of Sister Lucy and three other holy Italian women: "Stigmifere virginis Lucie de Narnia... facta admiratione digna". It contains a new letter of 1501 January 23 by the Duke Ercole and three other letters by the bishops of Ferrara, Adria and Milan. Also a four page poem (carmen theocasticon) in Lucia's praise. Four days later this booklet is there also published in German; later in Latin and in Spanish in Seville. Two more (abridged and anonymous) versions appear: one in Latin in Nuremberg 1501 and another again in German (Strasburg 1502). [A total of five printed versions appear in three different languages within two years]. 1501 December 30 the 25-year-old son of the Duke Ercole, Prince Alfonso d'Este marries 21-year-old Lucrezia Borgia by proxy in the Sala Paolina at the Vatican. Lucrezia leaves Rome on January 6 and makes her state entry into Ferrara on 1502 February 2 with a huge dowry and "her personal gift" of eleven Sisters and candidates for Sister Lucy's convent (which are timed to arrive a couple days ahead). 1502 February 16 (or January 18). At the personal request of the pope, Lucy is officially examined again (for the FIFTH time!) by the pope's physician Bernardo Bongiovanni da Recanati, Bishop of Venosa; at the presence of the entire Court. All her miraculous gifts, especially her ability to read thoughts and to predict future events, are confirmed as real again. 1502. Lucia continues councelling both nobility and ordinary people, rich and poor; is marked by a stunning wisdom and discernment. She is also visited by other Italian holy women (Stefana Quinzani, Caterina da Racconigi). By July 1502 her community of S. Catherina of Siena (of the Third Order of St. Dominic) reaches 72 members. The Duke Ercole anticipates a hundred; Lucrezia is helping Lucia with recruiting more vocations. Meanwhile the sisters themselves are divided. Some say that Lucy is much too young (then 25) to be a prioress and that she is not strict enough; while others accuse her "of excessive asceticism and evangelical radicality". Many are jelous of her priviledges and of her fame. 1503 March 26. The pope sends to Lucia 10 more sisters from another older Ferrarese Dominican convent (S. Caterina Martire of the Second Dominican Order). 1503 August 18. The pope, Lucrezia's father Alexander VI, dies (72 yrs old). 1503 September 2. Lucy is replaced by a new prioress Suor Maria da Parma, one of the ten sisters the pope sent her in March. The new pope Pius III, installed on October 8 and dies on October 18. On October 31 he is replaced by Julius II (1503-1513), the patron of Michelangelo. 1504 Corpus Christi. Suor Lucia is officially present at the ducal palace to witness the procession. On December 13th she is 28 years old, the Duke is 73. 1505 January 24 Lucy's patron Ercole I d'Este, Duke of Ferrara dies. Prince Alfonso becomes Duke Alfonso I d'Este (1505-1534). Some sisters at St. Catherine's convent immediately rise up in an open rebellion. 1505 February 20. Lucy, in the presence of the Dominican Vicar General and the new Duchess Lucrezia, has to sign a document which repeals all her privileges and in which she accepts the prohibition to leave the house and to speak to anyone in private (without the presence and supervision of another sister). Even her right to chose her spiritual director is taken away. Her Savonarolan confessor Fra Niccolo is replaced by Fra Benedetto da Mantova who is hostile toward her mystical experiences; her stigmata wounds disappear. Formerly a central figure of the Savonarolan Church reform movement, now she is very successfully discredited by being publicly accused of fraud - of simulating sanctity and of fabricating the wounds. (Probably she is also even accused of sorcery and tortured by the Inquisition). Her name is more and more often "prudently ignored"; whatever positive was previously written about her is now carefully deleted in the new editions. Exposed to the coldness and mistrust of her own community - and to the public disgrace and contempt - she lives for the remaining 39 years of her life (1505-1544) in total isolation. Forgotten by all those who previously venerated her so much - now - "known only to God". The saints continue to visit her in her visions. Shortly before her death, in the sixth of her, recently discovered, "Seven Revelations", she tells about the Virgin Mary saying to her: "Your name is Light because you are the daughter of the eternal light" (Tuo nome Luce perche sei fiola de la eterna luce). And Jesus is telling about her to the apostle Paul: "She [Lucy] has been greatly crucified by her false enemies. Some have broken her head, others the fingers of her hand, some have pulled her around and treated her badly, some have thrown her into the well, some have knocked out her teeth. And she has suffered all these things and great pain with true patience for my love". 1518 November 24. Lucrezia's mother dies. 1519 June 24. The Duchess Lucrezia (Borgia) Ercole dies after a difficult pregnancy with Isabella Maria d'Este (her eighth child - being only 39 years old). She is buried at the convent Corpus Domini. Her last Savonarolan spiritual director Tommaso Caiani in 1528 was assasinated in Tuscany, allegedly on orders of Pope Clement VII. His correspondence with Lucrezia was recently (2006) published by Gabriella Zarri under the title of "La religione di Lucrezia Borgia". 1521 January 3. Pope Leo X excommunicates Martin Luther (who lived 1483-1546 and who in 1511 had spent a month in Rome). In 1525 Giulia Farnese dies. 1534 October 31 dies Lucrezia's husband Duke Alfonso d'Este (born 1476 July 21 - five months older than Lucia). His and Lucrezia's son succeeds him as Ercole II d'Este (1534-1559). 1544. At the request of her confessor Lucy writes down a brief account of some of her revelations (which were discovered at the Pavia Library in 1999). * * * 1544 November 15. Two hours after midnight Suor Lucia Brocadelli dies and three days later she is buried at her convent (67 yrs old). The funeral has to be delayed because of a sudden and completely unexpected flood of visitors all wanting to pay her their last respects. 1545 December 13. The Council of Trent opens (47 years after Girolamo Savonarola died). 1548 August 27. Lucia's body is found intact and is transferred to a glass urn. (1564 February 15: Galileo Galilei is born in Pisa. 1567 October 1: Pietro Carnesecchi (friend of Giulia Gonzaga) is burned in Rome. 1600 February 17: Giordano Bruno is burned in Rome. 1647 November 15 the Church officially recognizes the Sister Lucy's uninterrupted veneration of the people. 1710 March 1 Lucia is declared Blessed by Pope Clement XI (1700-1721). On June 10 her relic arrives at the Cathedral of Narni and is placed in a special chapel. 1797 Napoleon suppresses the Blessed Lucy's convent of St. Catherine and her body is transferred to the altar of St. Lorence in the Cathedral of Ferrara. The site of her convent is cleared in 1813. 1935 May 26 (Sixth Sunday of Easter). After 440 years, at the request of Cesare Boccoleri, Bishop of Narnia (Terni and Narni), and with the consent of Ruggero Bovelli, Archbishop of Ferrara, BEATA LUCIA DE NARNIA RETURNS HOME (which she had left in 1495) and is SOLEMNLY RECEIVED BY THE PEOPLE AND THE CITY OF NARNI. Below: Beata Lucia - Girolamo Savonarola. Alexander VI - Lucrezia Borgia - Ercole I d'Este. The Cathedral and the Castle of Ferrara - The Cathedral of Narni. The Narnia italian logo and page design are copyright © 2003-2011.